Many tourists visit the Philippines for its pristine white beaches, incredible marine life, magnificent mountains, and other breathtaking scenery. But if you want to make the most of your trip in this country, then I suggest that you take on some challenging and fun adventures. Check out the following 8 adventures that were recommended by some Filipinos travelers. Do you want to take your cycling skills to the next level? Why not pedal your way up in the sky? You can try the Skycycle adventure in Davao at Eden Nature Park & Resort or the or Bike Zip in Bohol at Chocolate Hills Adventure Park. “To get to the area where the bike zip is located, one has to climb a long flight of cemented stairs. Quite tiring since we just came from a series of tree-top challenges. Participants are required to sign a waiver and to be properly geared up before climbing to another set of long stairs to get to the bike zip platform. You get to choose between a single bike or a double bike, but unfortunately, when we were there, the double bike is not available. It’s a round-trip experience of biking in the air with a view of the Chocolate Hills and the Bohol countryside. Definitely exhilarating especially with the strong wind up there. Don’t worry the bike is also suspended in wires just like you are. Finally got to try the skybike at CHAP! This adventure park also has a better view of the chocolate hills and a good way to spend your day with their adventures. Also an amazing way to conquer fear of heights! . Blessed with 7,100 islands, the Philippines is easily considered as one of the best diving destinations in the world. Some of the great dive sites in the country include Yapak in Boracay, The Canyons in Puerto Galera, Balicasag Fish Sanctuary in Bohol, Morazan Maru in Coron, Palawan, among others. “I am hydrophobic since birth. I had been pushed too often onto the sea that even at the slightest sight, I would cringe. I often slip when I am at the pool so that added to the trauma. When I worked in an outdoor equipment company before, I had been exposed not only to the mountains (which I found to be my comfort zone) but to the waters as well. Having to learn how to snorkel and how to dive was life changing. Though I still fear to be in deep waters, but at least I find it a bit comfortable when I use the diving equipment. Many types of water sports can be enjoyed when you travel in the Philippines; one that is quickly gaining popularity is wakeboarding. You can try this sport from any of the four wakeboarding centers: Lago de Oro in Calatagan, Batangas, CamSur Watersports Complex in Camarines Sur, Bicol, DECA Wakeboard Park in Davao, and Clark Wakeboard Park in Angeles City, Pampanga. “I first tried wake boarding in the summer of 2015 in the CamSur Watersports Complex. At first, I thought that it’s difficult balancing on a board while being dragged across the water but it’s actually not. Once you get the hang of it and find your balance, you’re good to go! I fell quite a few times on my first attempts and got dragged face down across the water. The instructor was witty enough to advise me that I should let go of the handle of the cable. He said I should learn to let go when it hurts already (lol). Anyways, if you’re up to trying something new, I would highly recommend that you try wakeboarding. You don’t need to know how to swim to be able to try it, it’s in the water (which is where we all want to be given the weather we have), it’s quite affordable and most of all, it’s a great and fun experience. Are you looking for something a little more extreme? Then head on over to Zambales and experience sky diving. Looking back, our most memorable moments are the ones where we attempt to conquer our fears. Congratulations, Hali! Cheers to more adventures this 2016! Solo skydiving in Zambales. If you can swim well and you want to inspect the underwater life up close without hurting the budget, then free diving is for you. Unleash your mermaid potential in any of the diving spots in the Philippines. If money is no issue then you might want to consider driving a watercraft or jet skiing. There are several resorts and beaches in the Philippines that offer this adventure on a per hour basis. Not only is the Philippines blessed with beautiful islands, it is also rich in majestic mountains. Many of these mountains can be conquered for just a few hours, hence mountain climbing is one of the popular outdoor activities in the country. One of the group activities that is quickly gaining popularity is canyoneering. It’s a full-packed adventure that involves swimming, trekking, climbing, and jumping into the water. As of this time, there is only one canyoneering spot in the country and that is Cebu. Have you done any of these adventures? Which one would you be interested to try? Great info shared. Thanks. Honestly, I haven’t tried any of these 8 adventures yet so I guess I am missing a lot of things. I should start getting these things done as soon as possible. All of them seem to have a unique thrill of their own, I would definitely try cycling in the sky. How are you able to balance on a rope? this really beats me! can anyone do it? looks straight out of a circus! I always want to try Skycycle and Canyoneering but I still haven’t found a schedule to these yet and of course the budget. Yet, you are such an adventurous person to have tried these. Kudos! You may want to add the zip-line in lake Sebu in your list. It’ll cross two mountains and a sure way to adrenaline rush. I’ve tried it several years ago, it sure was fun, but I don’t think I will do it again, haha! I have never been to the philippines, and didnt expect there are so much more things to do! would totally love to visit philippines soon. These all look like amazing experiences! For some reason, I am hesitant to try the skycycle. It looks the scariest of all the adventures lol. I so love visiting your Blog . I get to see so many amazing things about the Philipines. Funny , how we here in Europe don’t get to know much about your country . Thailand , China etc are quite popular here , but never anything about the stunning spots and places in the Philipines. Keep this great job up , your country is so amazing multifaceted , it is good to have you Bloggers spreading the word ! Thanks for this Miss Marge! 🙂 Yeah I wish I can dive again anytime soon! Thanks for promoting our country. This will surely engage foreign people. There are more to see in these places. I hope to see more posts of yours related to our country. I would love to visit the Philippines. It looks so beautiful. 🙂 The activities look very interesting, especially Skycycling. I had never heard of that before! This is a great list of adventures to experience in the Philippines. You’ve covered everything pretty well. How I wish Skycycle was already available when I visited Davao and Bohol before. Now, I have to return once again to experience it. Hahaha! As for skydiving, I think that although Zambales offers solo skydiving, beginners should never try doing solo on their first try. They don’t know how they are when doing it. Some first timers actually faint when doing it. It’s dangerous that way since they may pull the string late. Also, they might forget the proper landing. Anyway, thanks for sharing. I’ve never been to the Philippines, but I want to go someday. Your photos look beautiful. I would enjoy the mountain climbing, especially as you say it’s not too difficult. I would also enjoy going to Cebu because I love diving! I’ve never tried free diving though! As a less adventurous person I have to say I would do the mountain climbing and canyoning. The sky biking looks so scary tho i am afraid of heights so I probably wouldn’t get up there anyway. I can see though how different and innovative these activities are. 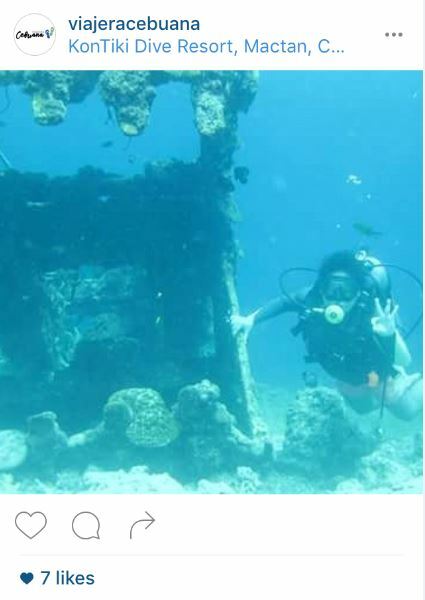 After reading your post, I had memories of the times I went scuba diving all over the Philippines. It has been a long time and my last dive was on 2003. Back then, I was already a higher level dive instructor and advanced technical diver. Naalala ko tuloy the five years I spent living in Boracay, the times I would go backpack with tourists all over, and the times I would come to Manila for a vacation and find myself going to Batangas to hangout with diver friends there. Its always my dream to try Scuba Diving, but after reading your listed adventures I want to try them all. Thanks Marge for including our entry on skydiving. 🙂 Good list. Personally I’d done only 2 from this list haha. Would love to learn freediving soon. Amazing, hopefully I can try this someday. Ooh, I’ve only done, 2!